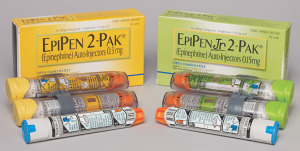 Mylan, the maker of the EpiPen®, offers a $0 co-pay card. Use the card at the pharmacy and you will not have to pay anything out of pocket. The card is good through December 31, 2014. Details at the link below.